While we did not experience the first snow of the season as some of our Midwest neighbors (I’m just a tad jealous…), winter is definitely peaking around the corner. I did light a fire this morning and snuggled with my blankie and cup of coffee. Last week I shared two books I am currently reading for non-fiction November. Apparently these are hot books for 2015 as I received numerous comments regarding each one. While I have yet to finish Big Magic, I am motivated to create. All work and no play definitely resulted in a very boring – and burnt out Molly. In fact, I questioned whether my right brain had completely atrophied and I was no longer capable of creative thought. But the brain is a muscle and with proper exercise, it can grow strong and productive. I am ready to exercise. In addition, I began to scrapbook again. We are taking a travel hiatus for 2016, and this is the perfect time to document past vacations. I look forward to reminiscing the good times, and creating albums to share with family and friends. I have plenty of projects to keep me busy over the next thirteen months. The KonMari method is rather controversial, it seems. Several of you commented saying things like she is OCD or “way out there” Now that I started reading the book, I understand the strong language. Apparently the author fixated on “tidying” at the age of five! Who thinks about cleaning up and organizing in kindergarten? She not only organized her own room, but also those of her siblings and the kitchen and the living room and… well, you get the idea. When she entered high school, she added discarding personal items to her weekly tidying habit. This woman takes minimalism to a whole new level. The socks and stockings stored in your drawer are essentially on holiday. They take a brutal beating in their daily work, trapped between your foot and your shoe, enduring pressure and friction to protect your precious feet. The time they spend in your drawer is their only chance to rest. But if they are folded over, balled up, or tied, they are always in a state of tension, their fabric stretched and their elastic pulled. They roll about and bump into each other every time the drawer is opened and closed. Any socks and stockings unfortunate enough to get pushed to the back of the drawer are often forgotten for so long that their elastic stretches beyond recovery. When the owner finally discovers them and puts them on, it will be too late and they will be relegated to the garbage. What treatment could be worse than this? I’m sorry… they are just socks. While I have no desire to take decluttering to this level, I do appreciate her philosophy: ask yourself, does this item spark joy? If the answer is no, then it is time to discard. Interestingly, I am thinking of adopting this outlook in other areas of life: if the task does not spark joy, I need to reconsider priorities. Well, apparently I am writing for a YA audience and not Middle Grade. I must confess, this does not come as a surprise. When I originally started First Impressionism, I wrote it as YA. 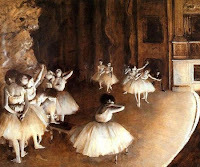 The protagonist was a fifteen year old freshmen, and the seedy ballet patrons featured prominently in the story. In addition, my writing style is geared towards an older audience. Writing for elementary students is not natural for me. My primary concern all along, however, has been the climax. I am just not sure I have the ability to write edgy YA conflict; I am more of a naive elementary student. But my beta readers told me I need to write YA; my writing partner told me I should write YA; and now my writing coach confirmed their opinions. So… YA it is. I continued the blogging routine this week, plus added a guest post opportunity. The Journaling towards Wholeness series continued this week – focusing on Privacy and journaling via computer. I discovered the beauty and peace of Small Town Kansas, and wrote a guest-post for Kari. This Thursday we celebrate Thanksgiving here in America. I will teach class on Monday and then have the next six days free! Plans have changed and we will not be traveling – nor will children come home. It will just be the two of us. While this is a bit unusual, I think we are looking forward to the peaceful spirit of this holiday. And I may actually have time to participate in the Thankfully Reading Weekend. I share many of your thoughts on the Kondo book. I was particularly troubled by her suggestion to store books in a CLOSET and to keep only a small number of books. I'm no hoarder — far from it — my book collection certainly "sparks joy"! I must confess… after reading about socks, I kinda skimmed the rest of the book. I love the plan to take a photo a day. I need to keep my camera with me in preparation. Happy Thanksgiving! Hope to see you during the Thankfully Reading Weekend. It sounds like there are some good suggestions in the KonMari book but everyone just needs to adopt what works for them.